Our monthly format is designed to keep you up-to-date on sweeping industry happenings. Please thank and support our sponsors! Let us know what kind of coverage you'd like us to provide from our industry trade shows and elsewhere. 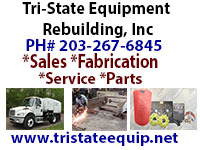 Click on the graphic above to contact us. Since 1995 I have presented our annual Award of Excellence in Power Sweeping at the National Pavement Exposition (NPE). This year our honoree is the first-ever repeat winner, Michael Nawa, who previously received the award in 2004, along with his father, Andrew. Michael has remained dedicated to improving the professionalism of the power sweeping industry in the years since then, first as a Board Member for NPE and continuing on as a Board Member and Mentor at the World Sweeping Association. Although Michael recently sold his company, Custom Maintenance Services, after over 40 years of operation, he plans to continue assisting newbie sweeping contractors in the coming years. For the last four years the folks at NPE have also designated a Sweeper of the Year. This year that honor went to another long-time industry professional, Debbie Jacketta, along with Jacketta Sweeping Service, the company founded by her father, Neal. Congratulations to both Michael and Debbie, as well as the professional teams that have backed both through the years. I must say this year's NPE was an extra-special one for me, as well. I was humbled by the honor of receiving the NPE's Alan Curtis Industry Service Award , named after a long-time pavement professional who left us in 2013 at the tender age of 66. The award also included my installation into the Pavement Hall of Fame, a singular honor. It was a pleasant surprise to receive such a notable 'lifetime achievement award,' though a sobering one since this year I became older than was Alan Curtis when he passed on. When it comes to professionalism, though, none of us have bragging rights over Shang Wuji, linked below and newly featured in our 'Noteworthy in Sweeping' category. I doubt any of us in the awards categories above can boast that we've been on the job every day for the past 12 years – and Wuji has only one leg and was born deaf and dumb! His is an amazing story. While we're discussing professionalism and diligence, congratulations to the management team at Schwarze Industries, Inc. for gaining 9001 Certification for that company. Congrats also to Greg Heyer for his promotion from being a VP at Schwarze to President of Old Dominion Broom, both of which now belong to The Alamo Group. I know that professionalism is supposed to be its own reward. That said, it's also nice to be recognized as someone who has a good work ethic and delivers an exceptional end product. When's the last time you gave an award to someone on your team? Perhaps you should. And, in case you're wondering, I brought back lots of coverage from this month's NPE. Look for it starting in our March newsletter edition. As always, if you have any news of potential interest to the power sweeping community, please let us know. Between this publication, the WorldSweeper.com website, and the World Sweeping Association, we'll be sure to get the information passed along to interested readers. PS If you haven't 'liked' our WorldSweeper Facebook page, what are you waiting for? That's where we offer industry previews and updates on an ongoing basis. 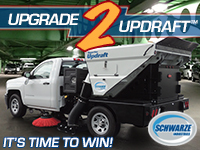 At the National Pavement Exposition, held in Cleveland early this month, the 2018 WorldSweeper / World Sweeping Association Award of Excellence in Power Sweeping was presented to Michael Nawa, longtime owner of Custom Maintenance Services. Nawa is the first two-time winner of this award. In 2004 he was a co-winner, with his father, of the pre-cursor to this award, American Sweeper Magazine's Award of Excellence in Power Sweeping . Being chosen again this year, fourteen years later, is a nod to Michael's involvement in the power sweeping industry since that time. He has been a Board Member for the National Pavement Exposition, is currently a Board Member for the World Sweeping Association and has worked through WSA as a mentor for many other, less experienced, contractors through the years. Check out the Award Ceremony. For the last several years a team at the National Pavement Expo have designated a U.S. sweeping contractor as NPE's 'Sweeper of the Year.' This year their choice was Utah-based Jacketta Sweeping. Celebrating 50 years in business this year, Jacketta Sweeping Service, West Valley City, UT, is a family-owned company that over the years has demonstrated the management initiative to "change its stripes" based on market demands, and is pro-active in supporting and developing the sweeping industry. Check out that Award Ceremony. 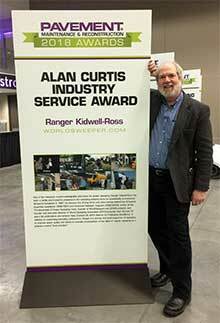 It is with extreme pleasure that we announce that our WorldSweeper.com editor, Ranger Kidwell-Ross, has been honored with what is arguably the highest award in the United States pavement industry. The award is named after Alan Curtis, who was a central leader in the U.S. pavement industry and died in 2013 at the age of 66. Each year the winner of the award named after Curtis is also installed into the U.S. Pavement Hall of Fame. When it comes to the power sweeping segment of the pavement industry, Ranger has secured his place as the most visible advocate for the environmental and other aspects of sweeping in the U.S. and around the world. Since he entered the industry in 1987 he has become the leading author in the world on the topic of pavement sweeping, has compiled the largest power sweeping information resource in the world and founded the World Sweeping Association. Check out the link below to read the details. Cleaning up the streets of New Orleans after its annual Mardi Gras' celebration is a daunting task by anyone's standards. As of press time, this year's parades have yielded approximately 950 tons of debris and counting. Last year's total was over 1,300 tons and the mayor's office said it expects that, given the warm weather they had this year, this year's haul may well be larger. 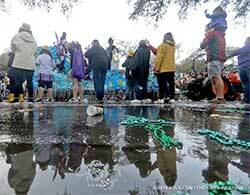 A new product was added this year in an attempt to keep beads from blocking storm drains. The city added 250 "gutter buddies" after having to clean out about 93,000 pounds of beads from catch basins last year. These reportedly worked well and will likely be re-utilized in future years. To facilitate cleanup, about 950 employees are on the job. All available sweepers are deployed, along with dump trucks and other support vehicles. In addition to the link below that discusses this year's event, you may want to revisit this article WorldSweeper.com's editor wrote over a decade ago when he covered the cleanup in person. Despite having one of his legs amputated and being born deaf and mute, a hardworking Chinese man won the hearts of people and inspired others with his incredible passion for work – which he has done at 4am every day for 12 years – be it rain or shine, snow or sleet. Now, with this feature article at WorldSweeper.com and installation into our 'Noteworthy in Power Sweeping' hall of fame, there's no doubt those in the American and world sweeping industry will be amazed and impressed, as well. Read about this inspiring individual. Soundcore Capital Partners' portfolio company, Sweeping Corporation of America, Inc. (SCA), announced that it has entered into a $60,000,000 credit facility with Comerica Incorporated. Comerica served as the sole lead arranger and administrative agent for the facility which will support upcoming add-on acquisitions and growth initiatives of the business. The management team of Schwarze Industries, Inc. has announced it has been awarded the ISO 9001:2015 Management System certificate by the SRI Quality System Registrar in Pittsburgh, Pennsylvania. ISO certification is based on quality management principles including strong customer focus, motivation and implication of top management, the process approach, and continual improvement and review. The goal is to ensure customers receive consistently high-quality products and services. Being ISO certified means our customers can have confidence that Schwarze is committed to quality and outstanding customer service. Emerald Expositions, which owns and operates National Pavement Expo, has decided to augment that 33-year-old event with a new event aimed at the West Coast market. Called National Pavement Expo West, the new event will be "co-dated" with another Emerald Expos show, the International Fastener Expo. become a WorldSweeper.com "Facebook Fan" and "Twitter Follower"
Thanks for reading WorldSweeper.com's February 2018 Newsletter!